Yesterday we revealed the 4 Steps To Take After Your First Sales. Today we cover the 4 ways of preventing “Cart Abandonment” to ensure more sales. Up to this point we’ve created a Shopify store, how to choose the best products to promote and we’ve ran our first Facebook ads. Now it’s time to address critical elements of your store that can result in substantial sales increases. One of those critical elements, and the focus of today’s post, is shopping cart abandonment. The rate of shopping cart abandonment is calculated by dividing the total number of completed transactions by the total number of initiated transactions. With this built in system, Shopify automatically sends an email to any customer who abandoned the checkout process. This email contains a record of the initiated purchase and their saved billing info. all the customer has to do is confirm the purchase. Very powerful. Sometimes all people need is one more nudge. Click any checkout number to open the associated order details. Once forwarded to the next page you can customize your recovery email which will contain a link to the checkout page with their order information already populating all required fields. Shopify has a huge built in app called Kit, which is a virtual employee, exclusive to Shopify merchants that helps small business owners overcome marketing challenges. Kit Kart, an app designed to enhance the capabilities of Kit is able to track and engage people who were about to purchase from you but, for whatever reason, abandoned before completing their checkout. 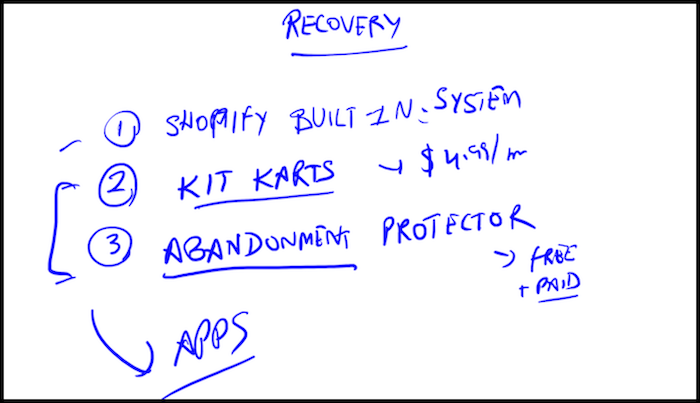 Like Shopify’s built in recover system, Kit can also automatically send out an email to customers who abandoned the checkout on your behalf. Instead of emailing anybody who looked at a product but didn’t buy, Kit only emails customers who were seconds away from checkout – the most likely to convert. The one thing about Kit Kart is that everything is done by code which is not exactly beginner friendly. Doesn’t make it any less powerful, we just want to prevent headaches and learning curves whenever possible. Abandonment Protector, like the two aforementioned options, is a specialized App that detects when customers abandon a shopping cart. With easy to use tools, you can implement cart recovery for your store by sending advanced email campaigns depending on the value of the cart, date range, etc. It offers a detailed stats page and additional tools to help you improve your abandoned cart recovery. That’s a wrap for Day 11 – Great work! P.P.S. Click here for Day 12!